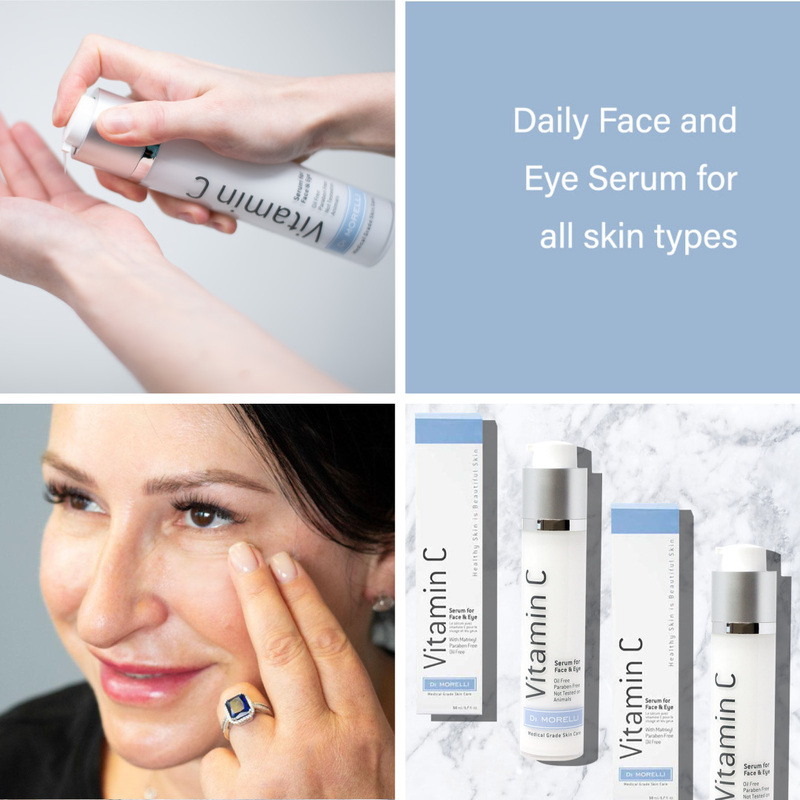 Di Morelli Vitamin C Serum for Face and Eye is an oil-free, highly potent, and fast absorbing treatment for all skin types. Best when applied in the morning on clean skin, apply 1 pump (approximately the size of a nickel) to face, neck and eye area. Peptide made up of Palmitic Acid (fatty acid) and amino acids. Considered as effective as Retinol for collagen stimulation and with no irritating side effects. Research shows it can increase collagen, elastin and hyaluronic acid. Also known as Matrixyl. A peptide made up of five amino acids that are linked together and attached to a fatty acid. Considered as effective as Retinol for collagen stimulation and with no irritating side effects. Research shows it can increase collagen and elastin production. Form of Vitamin C with Glucose. Contains two glucose molecules, which act to prevent oxidation and retain its power until absorbed by the skin into the dermis. Strong antioxidant which protects skin from ultraviolet radiation and neutralizes free radicals. Increases collagen production. A humectant or “water magnet” that binds with water molecules and traps them in skin cells. Replicates and enhances skin’s self-moisturizing ability. This was our very first product and it continues to be our top seller. It was created to treat the most common skin concerns and patient complaints: fine lines, wrinkles, uneven skin tone and skin laxity. We knew it needed to be strong enough to make a noticeable difference and delicate enough to be used on all skin types, every day.